Mnemosyne aims to be a user-friendly flash card program, with a clean, deceptively simple interface that does not require you to wrap your head around complicated concepts before you can start using it. At the same time, under the hood it is very powerful, and its architecture allows infinite extensibility and customisibility through plugins and a scripting API, for the benefit of power users. Here are some screenshots of Mnemosyne in action, illustrating its features. From the information below, Mnemosyne will generate two sister cards: a so-called 'recognition' card asking you to come up with the translation of the foreign word, and a 'production' card asking you to come up with the foreign word. Of course, if you edit the material on the card, both cards will be automatically updated. You can easily display precisely the cards you are interested in, sort by creation date or difficulty, ... . Note that you can add tags to each card to organise them. 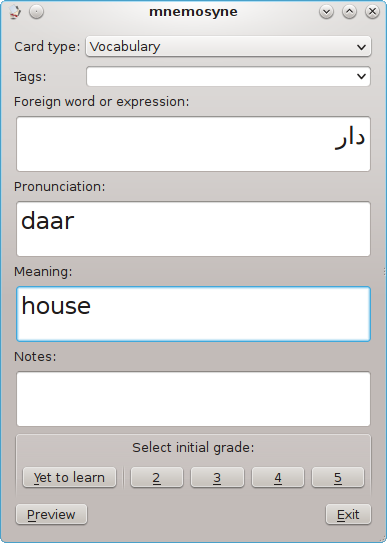 Cards can have multiple tags, and you can organise tags in a hierarchy. 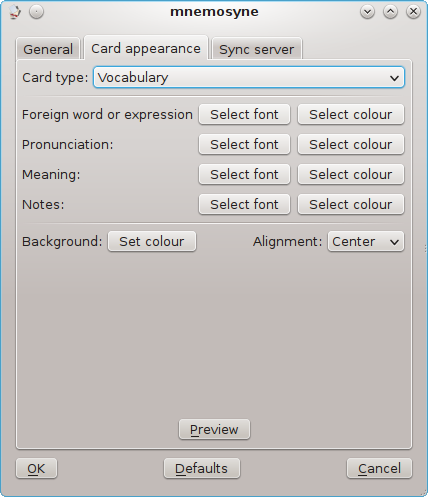 The different colours in each line in the browser are the background colours the user has chosen for different cards. Mnemosyne comes with a full set of statistics to illustrate your learning process: past and future schedule, retention score, cards added, ... . Sometimes you don't want to study all your cards at the same time, but only focus on a subset of them. You can easily select which cards to study based on tags or card type, and save this set for future use. The system is very flexible, as cards can belong to more than one set, and the sets are automatically updated if you e.g. edit a card to add or remove a certain tag. 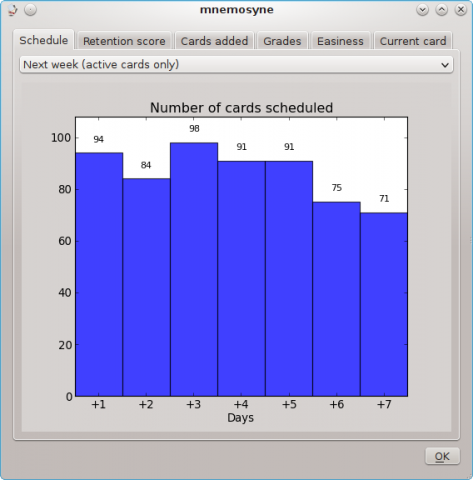 Mnemosyne also has different learning modes, either focusing on reviewing your scheduled cards first, or focusing on learning new cards first. There is also a cramming mode, which allows you to do as many reviews as you want without affecting your regular scheduling data. 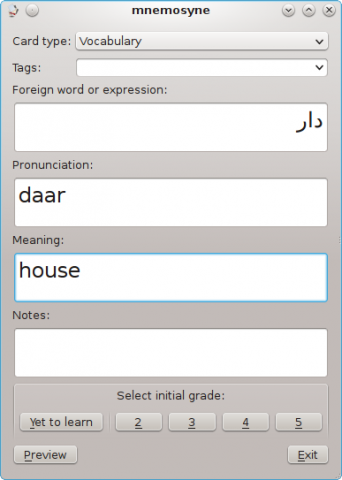 Mnemosyne can import from a wide variety of formats, not only plain text files, but also full import from Anki supporting custom card types and learning data, as well as import from SuperMemo and CueCard. Mnemosyne offers many configuration options, e.g. full control of the appearance of each element in your cards. Mnemosyne is conceived in such a way that every part of the program can be extended or changed, even core parts like the scheduler and the database system. Mnemosyne comes out of the box with a number of plugins, like those of a cloze card type (to selective hide several parts of a text) and a cramming scheduler (e.g. 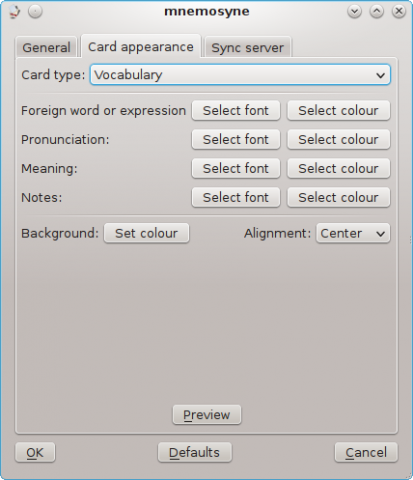 to drill your cards before an exam without affecting the default scheduling). Thanks to the plugin mechanism, we can keep the main interface of Mnemosyne uncluttered, yet still offer complete customisibility to power users. 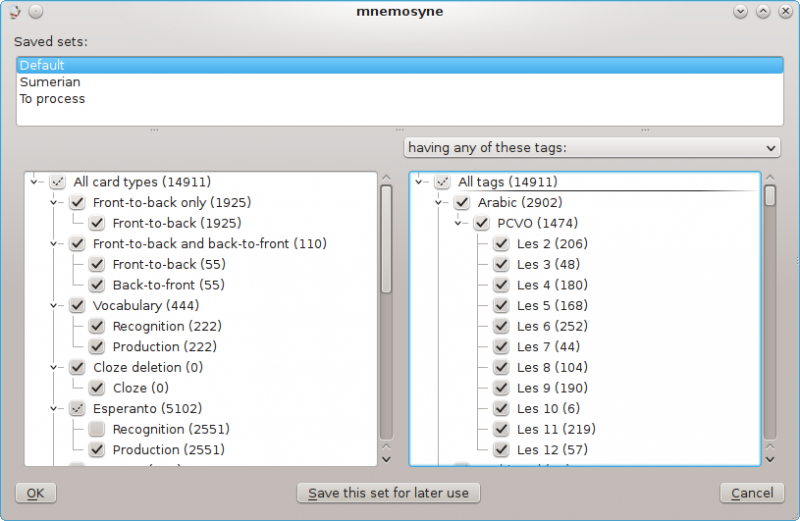 Mnemosyne contains a built-in sync mechanism to allow to sync e.g. your laptop to your desktop machine. It is fully bidirectional, i.e. you can add new cards on your desktop and review old cards on your laptop, and both sets of changes will be merged seamlessly. Can sync with more than 1 partner. Optimised for speed and memory usage on mobile devices. 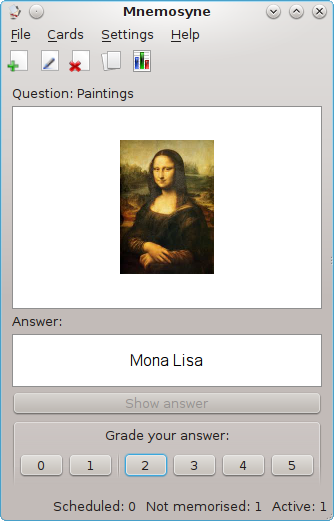 From the configuration screen of the main program, you can start a web server which allows you to do reviews on any other machine using a web browser. Note that this does not contain any security features.